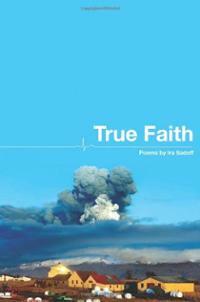 True Faith (BOA, 2012) is Ira Sadoff’s eighth book of poetry, coming nine years after the collection Barter. He has won numerous awards, including a Pushcart Prize and the Leonard Shestack Prize for the book of poems Grazing in 1998. Sadoff is also a critic and scholar of poetry. He currently teaches at Colby College in Maine and the MFA program at Drew University in New Jersey. In regards to his own poetics, Sadoff characterizes himself as “one poet among a decreasing minority who is trying to resist the return to formalism, the sterile, conservative, aesthete academicism of the nineteen-fifties.” This can be seen in True Faith, which evokes a feeling of being down-to-earth and accessible while toying with large ideas such as religion and death. Throughout the book, the speaker of the poems is at battle with the question “What is true faith?” The opening and title poem, “True Faith,” delves the reader straight in: “True faith belongs to the truly unstable, / To those enormous sunflowers that keep crows away / With their bowed heads almost touching the garden floor.” This remark is sardonic and natural, leaving the reader with a statement and a metaphor. True faith is for the unstable, yet is also for the sunflower that behaves as if in prayer. This image-coupling is a common technique that Sadoff utilizes; sometimes there are three or four thoughts in one sentence. This energetic technique behaves as a catalyst in his poetry. Look at the energy in this sentence from the poem “Id”: “If I say I want a dancer’s body, / I don’t want to dance: I want to be lithe, / lasting a little longer to take in / the traffic jams.” Each line is a surprise and that surprise leads to laughter. he was, inscrutable and terrible in unequal doses. Notice the energy of the lines. Here the speaker humanizes the idea of gods, making his father a god. The beauty is in the language, its arching simplicity and strong use of images. Formally, many of the poems behave the same way, either free verse tercets or quatrains. The movement down the page comes from the energy of the line and the surprising imagery. In “While in Brooklyn”: “There’s a government here, a world order / with its cattails and oil spills, / and just under the surface a corpse or two.” The line unfolds with surprise and leaves the reader with a stark, ironic image. The second section is a little different formally. The lines are shorter; however, the shape of the poem and the energy of the line remains the same. True Faith is a testament to sardonic wit, irony, and accessible language. Sadoff’s care with the English language and beautifully crafted poems leaves the reader satisfied and also questioning. When Sadoff writes “My first roses brought me to my senses” in “My First Roses” the language becomes real and tangible. The reader can sense the roses that brought the speaker to his senses. Even a non-reader of poetry can appreciate the language in this book. It is a book that is both accessible and beautiful. Not an easy task. Tags: Ira Sadoff, True Faith. Bookmark the permalink.